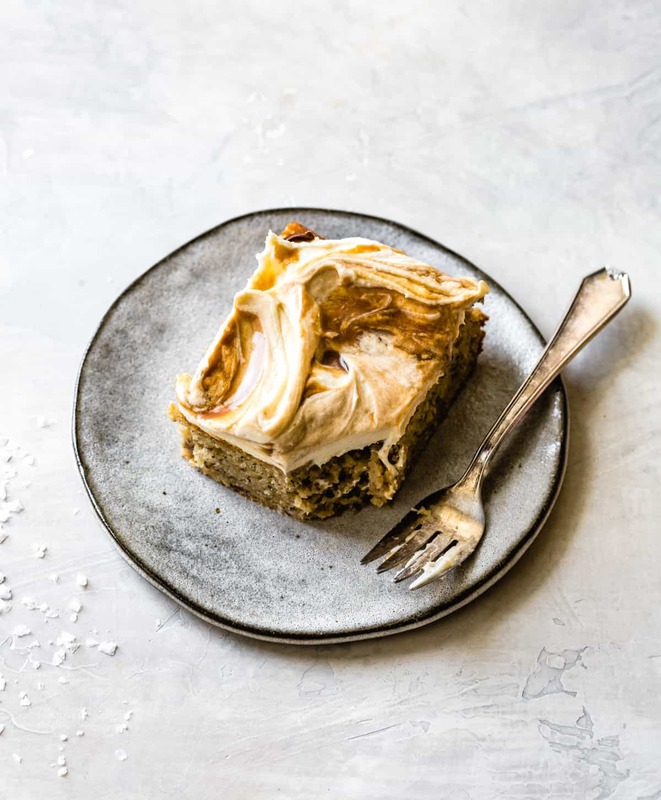 This super moist gluten free banana cake gets loads of flavor from brown butter, brown sugar, coconut flour, and butterscotch-swirled cream cheese frosting. 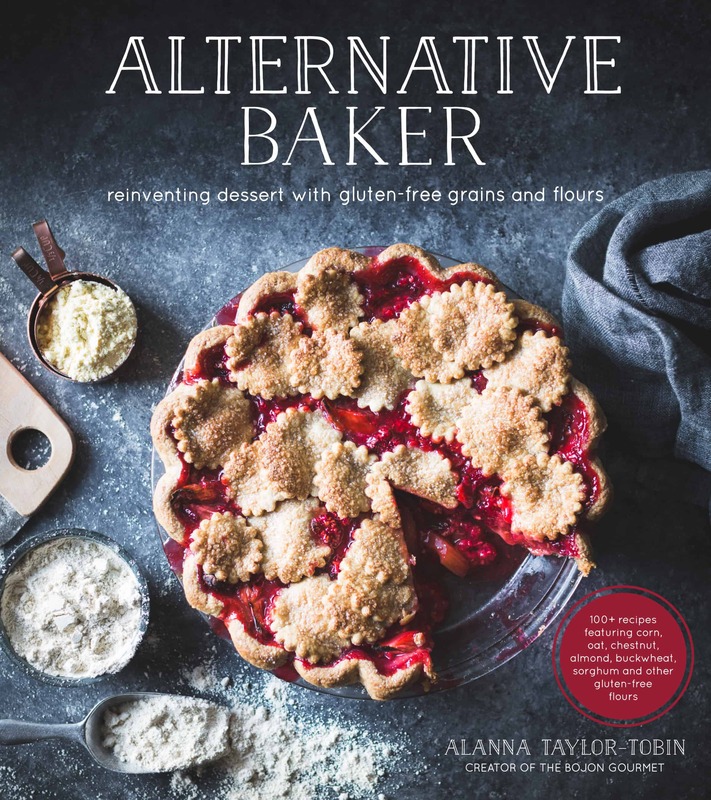 This week marks the 9th year of The Bojon Gourmet, and the second year of Alternative Baker. I started this site on a whim when I failed to find a good recipe for sourdough crackers online and took matters into my own flour-streaked hands. I never dreamed that it would bring so many good things my way. 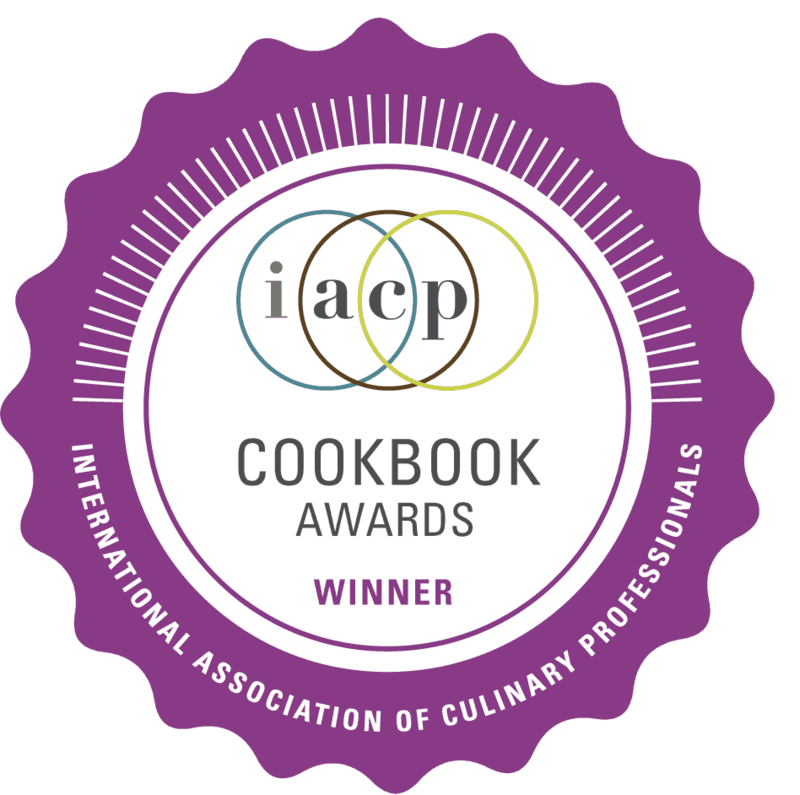 550 recipes later, I’m blessed with a huge, supportive community of fellow bloggers, entrepreneurs, eco-conscious brands, and readers all around the globe. What better way to celebrate than with cake?! This banana cake recipe is adapted from the dairy free + gluten free banana cake topped with boozy chocolate ganache that I shared earlier this year. 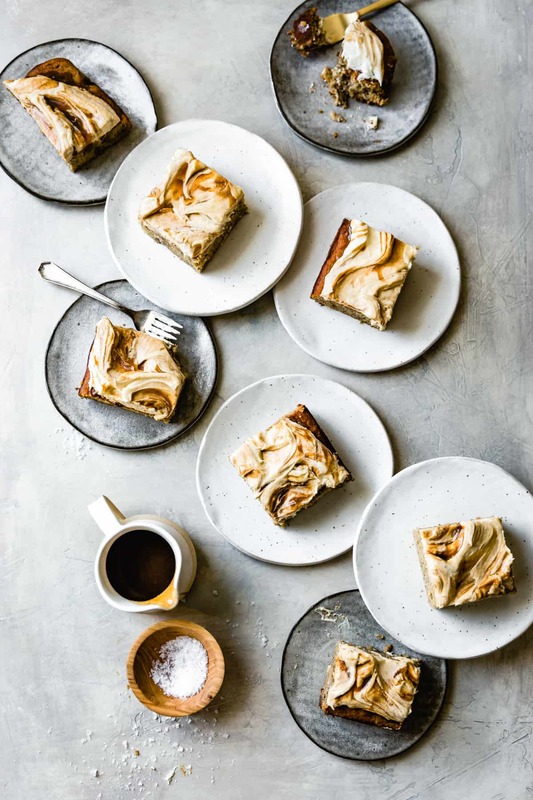 I was so in love with its delicate crumb and warm banana flavor, I dreamed up this version infused with the butterscotchy flavors of vanilla bean brown butter and brown sugar. 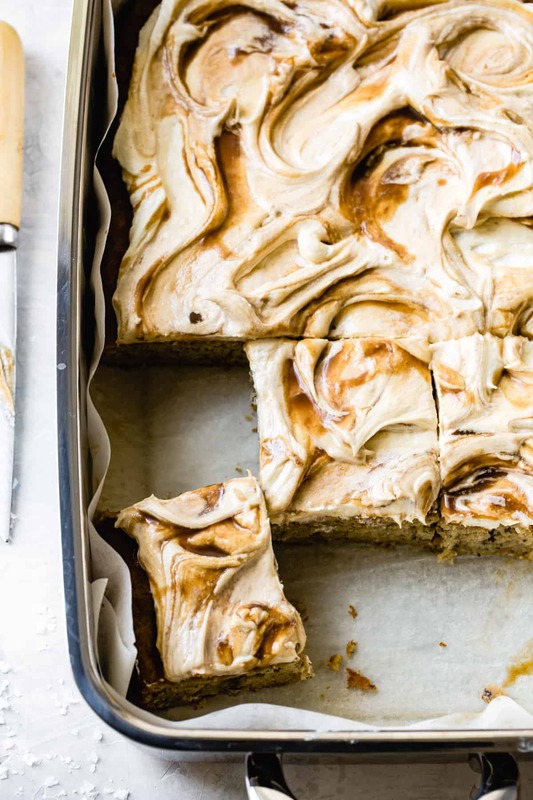 Inspired by this luscious photo from The Boy Who Bakes, I topped the cake with cream cheese frosting and swirled in boozy butterscotch sauce. 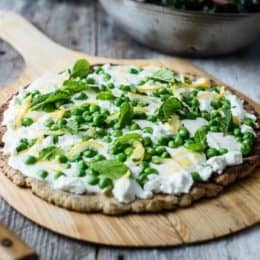 I always love when gluten free recipes best their wheaty counterparts, as is the case here. 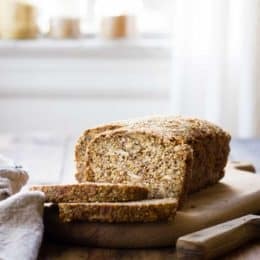 A trio of flavorful gluten-free flours – millet flour, coconut flour, and sweet rice flour – create a meltingly tender, yet well-structured, texture. Millet flour’s soft, powdery texture fluffs up the cake while adding buttery flavor. High-fiber coconut flour absorbs excess moisture while adding tropical topnotes. And sticky sweet rice flour (also known as mochi flour) holds the cake together. My friend and sometimes assistant Bebe helped me test this recipe, and when we took our first bites of warm cake, redolent with sweet vanilla and caramelized butter, we both swooned and Bebe said, “this is the most moist cake I’ve ever baked.” Such can be the advantage of gluten free flours, which don’t develop the tough dryness of glutenous flours. 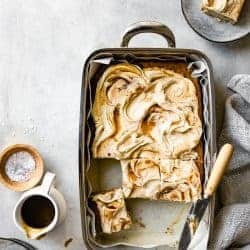 My original banana sheet cake recipe fits a 9-inch square pan (or 8×10 rectangle) so I increased the recipe by 25% to accommodate the larger 9×12-inch sheet pan. And I simplified the method a bit: instead of beating the sugar into the cold butter, I simply whisk together all the wet ingredients, stir in the flour mixture, and fold in the whipped egg whites. 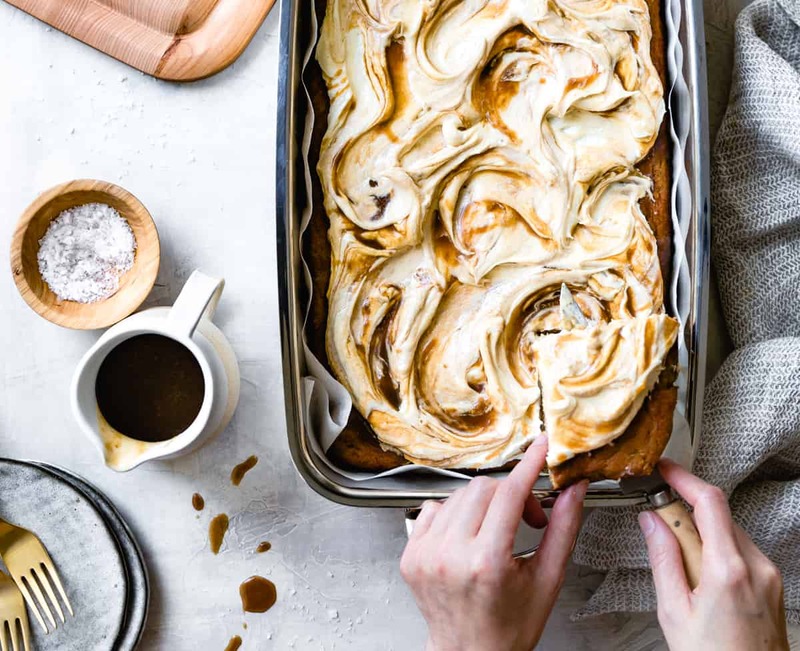 While the cake bakes, make the cream cheese frosting and butterscotch sauce – both come together with speed and ease – and you’ll love swirling the two together on top of the cooled cake. 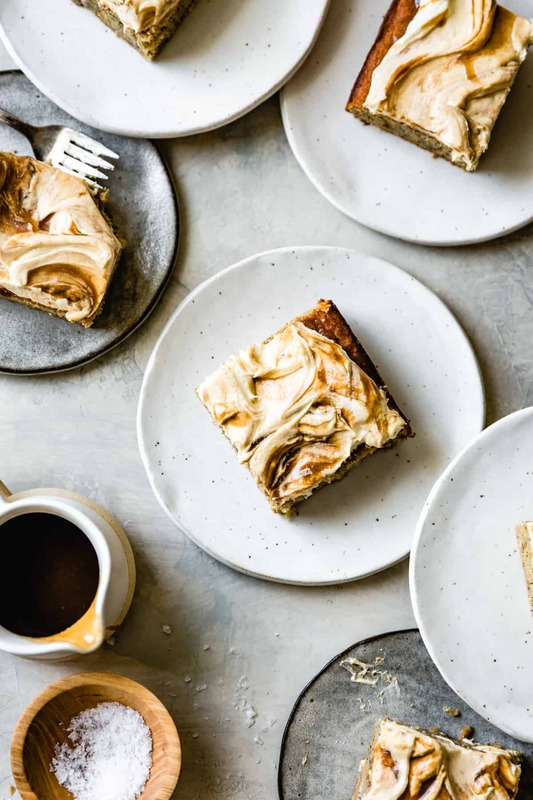 Cut yourself a slice and revel in the addictive flavors of brown butter, brown sugar, ripe bananas, tropical coconut flour, and plenty of salty acidity in the frosting to contrast the sweet cakey richness. If you’re like me, you’ll find yourself wanting to give away as much cake as possible while also hoarding it all to yourself. An impossibly delicious conundrum. Thanks to all my wonderful readers for coming along with me on this 9-year journey! Thank you for all the sweet notes, smart questions, kind words, follows, likes, and supportiveness of TBG. I wouldn’t be doing this without you. Position a rack in the center of the oven and preheat to 350ºF. 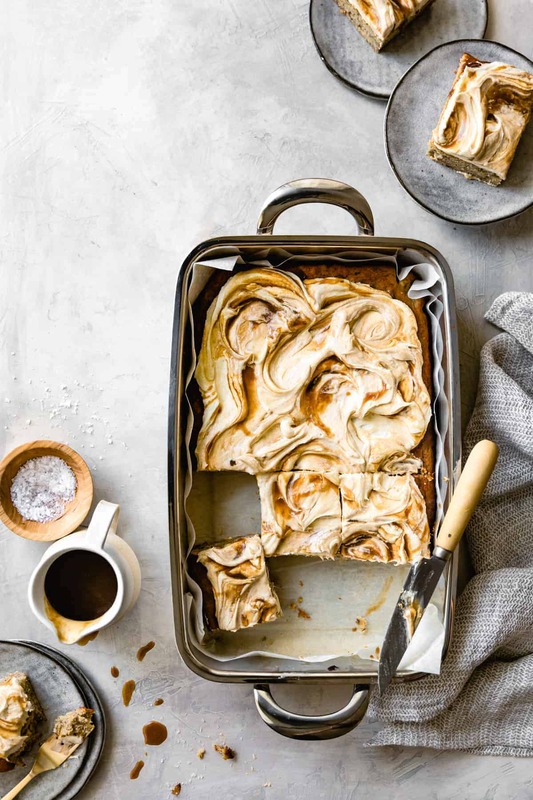 Line a 9x12-inch baking pan with parchment paper on all sides. Place the butter and vanilla pod and scrapings in a medium, heavy saucepan. Melt the butter over medium-low heat, then continue cooking the butter until it turns golden and smells nutty, swirling the pan to prevent burning, 3-5 more minutes. Pour the butter into a large, heat-proof bowl and let cool to warm. Whisk in the brown sugar, banana, egg yolks, and buttermilk. 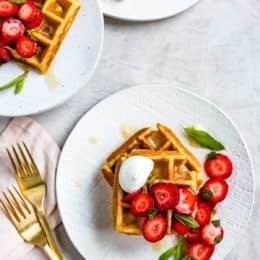 Place a strainer over the bowl and add the sweet rice, coconut, millet, and tapioca flours along with the baking powder, baking soda, and salt. Sift into the wet ingredients, and stir to combine. In the bowl of a stand mixer fitted with the whip attachment (or in a large bowl with an electric beater or whisk) beat the egg whites on medium-high until foamy. Gradually add the sugar and continue beating until the whites hold soft peaks. Gently fold one-third of the whipped whites into the batter, then fold in the remaining egg whites. Scrape the batter into the prepared pan and smooth the top. Bake the cake until golden on top and a toothpick inserted near the center comes out clean or with a few moist crumbs, 40-50 minutes. Remove from the oven and let cool completely in the pan. Prepare the butterscotch sauce, cool, and chill until needed. Make the cream cheese frosting and reserve at room temperature until needed. Spread the frosting over the cooled cake. Dollop and drizzle some of the butterscotch sauce over the frosting, and use the back of a spoon to swirl it into the frosting. Serve slices of cake with extra butterscotch sauce if you like. 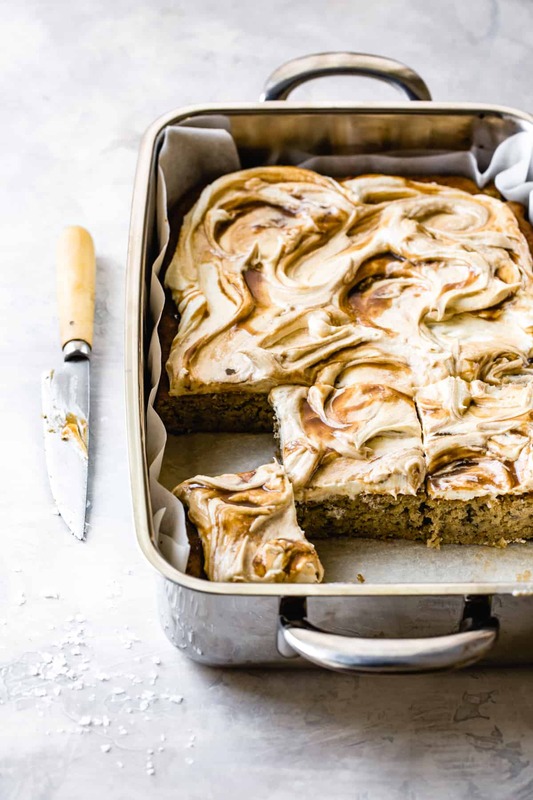 The cake is best served at room temperature, but extras can be chilled airtight for up to 4 days. Wow! 9 years! That is quite the accomplishment as running a blog can be tough. But you do it so beautifully. As for this cake. . .good golly miss Molly!!!! Wishing I had a slice right now. And I can’t get over that butterscotch drizzle too (she drools). Aw thanks so much Lynn! Having blog is certainly like having a very needy pet, isn’t it?! Ahhh what a huge accomplishment Alana! Wishing you many more successful, and happy bloggiversaries (yeah, just contributed to the English language with a brand new word 😂). Soooo excited for what is to come and looking forward to celebrating with you! Hi, Alana! I have all the ingredients to make this cake, except the coconut flour. It’s pouring out here and I’d rather stay cozy and bake, than run to the store. Can you suggest a flour alternative that may work (almond, chestnut, sorghum, rice etc)? Love your trusted recipes and your site! Keep going! Hi Tracy! Thanks so much for the sweet words! 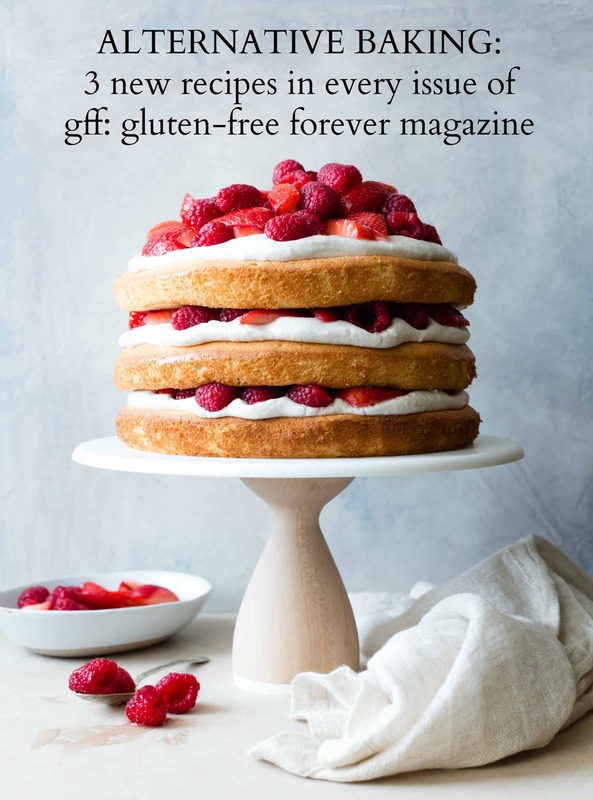 I actually just published a teff flour version of this cake in the latest issue of GFF Magazine – it’s available here for download: https://gffmag.com/shop/issue-17-downloadable-pdf/ Coconut flour is much more absorbent than other flours so it’s quite tricky to substitute. The teff version should be easier to experiment with – you could swap the teff for any of the flours you mentioned (by weight if you can). Congrats Alana!!!!!! I still remembering stumbling across your blog for the first time (while looking for banana buckwheat pancakes) and the first recipe I made from your site–the flaky goat cheese + chive biscuits, the deliciousness of which turned me into an avid follower. Your recipes and photography are seriously unparalleled and I’m excited for this excuse to use up the coconut flour lingering in my pantry!! 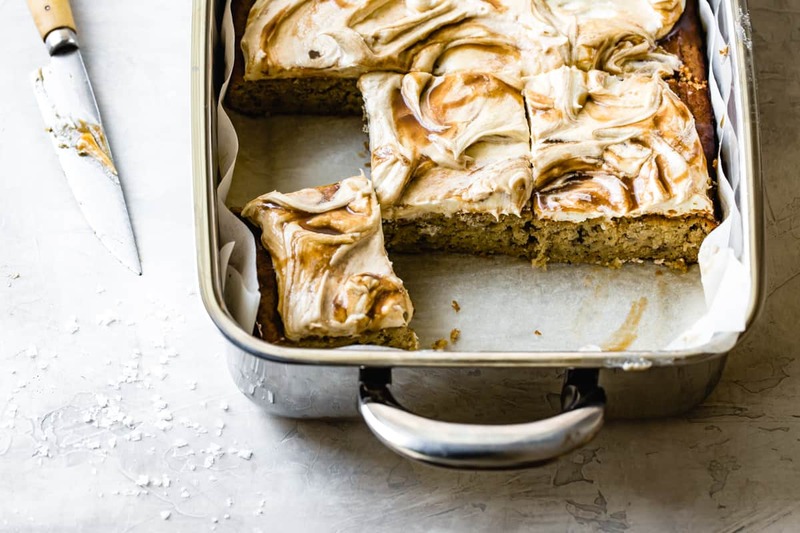 thank you for sharing the recipe I love banana will try.